This post is going to be an important starting point for all ladies who want to do something new for their bedrooms and give them a dose of elegance and convenience with the help of a single element. Bedroom benches have been off the scene in the major interior design schemes in the past few years, and I can’t really figure the reason why. They work as kind of a stylish extension and wrap the entire look: the night stands, the large bed and the bench in front. Perfect. The bench doesn’t look like it did in the earliest years of its design, which is why we’re focusing on it today: it’s way fancier, way more modern in its appearance and what’s most important – it doesn’t serve only as a decorative bench anymore! Nowadays, you can find indoor bench seats that look like stylish boxes and are able to serve for storage as well. Now this is what I call a convenient furniture piece. 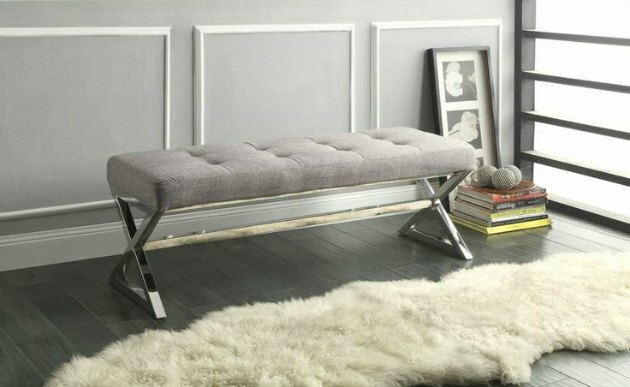 So, in what way would you use an indoor bench into your stylish interior kingdom of a bedroom? I like tastefully designed bedrooms with neutral tones and shades close to each other in the colour palette. Like, having the bedding in one nuance, the rug in another slightly brighter or darker, and even when the walls are painted in a shade that complements the entire colour pattern. A colour combo like this emits an ambience of clarity and order and it’s very Feng-Shui. However, just like we do when we dress ourselves, adding something with a lively design and colours like print, would do wonders for the look of the bedroom. For example, in rooms painted with nuances from just one colour, something like printed indoor bench seats would instantly give focus. When you enter in it, it would be the first thing you’d see and you’ll love it, because after that first eye-contact every other piece of furniture would have a meaning. When we think of a bench, what instantly comes to mind are the wooden pieces we see in parks. So I’d say, wood as a material for indoor bench seats will certainly give the piece a dose of authenticity. I say authenticity because the park bench is more than just a seat – it’s part of the beauty of the park, the place where so many conversations (good news delivered on a park bench – priceless) are held along with a cup of coffee ‘to-go’ and a splash of sun, and oh well, it’s the spot where a fair dose of romance happens. Aside from the very pleasant association for wooden benches with the parks (at least for me, hopefully for you as well now) in interior design these pieces work in favour of vintage style. I’d use them in a bedroom where the bed has simple and minimal lines, the room isn’t stuffed with too much decorations and generally leans towards the vintage side of interior design. The wooden bench would accentuate all that ambiance. Besides being a bench for sitting, and if it’s a box design – for storage too, the bench you’d place in front of your bed in the bedroom can have other, more creative purposes. For example, if you’re not using it as extra space for sitting or placing your shoes for a short moment before putting them on, you can use the bench as a place for exhibiting your most favourite books. All book lovers know how important it is for them to see their purchased books in one place, perfectly arranged and available for a quick read at any time. Ah, the delights. Plus, we all know how certain hard-cover books can be a stylish and meaningful decorations to a room, right?